I hope Portsmouth will become the Jersey City of Hampton Roads (in some respects). wow, this is actually impressive. the picture looks like they will actually use their downtown as a downtown. Portsmouth needed something like this to happen. Yup, its only a matter of time. Portsmouth and Chesapeake were the only Hampton Roads cities that hadn't announced major development plans. Now only Chesapeake is left. Isn't Cpeake trying to redo South Norfolk? Besides, Cpeake's big projects are roads. If they have any major land development projects in the next 5 years, they might as well give all the residents bikes. This is a fantastic plan for the Portsmouth waterfront. I like the traffic circle as a kind of gateway, and the spaced towers are impressive. One could believe Donald Trump has a hand in this! Actually residents in Chesapeake had it out with the city and the city signed something that it would slow progress down for at least 20 years and I read in on the hamptonroads.com. They had a big petition with a lot of people signing it and took it to a city meeting. I like the traffic circle too. Gives a kinda classy european flair to things. Those towers look more like something you'd see in Miami than P-town. It's been a long while since I've been down in downtown Portsmouth, and somethign about this "vision" just didn't look right to me. So I called up the handy google satellite view. Just like I thought. These four towers we see in the renderings aren't exactly facing the great views on downtown Norfolk. They are looking across the southern Branch to the shipyards and drydocks of South Norfolk. Granted, you do get the downtown view if you're facing North, just doesn't seem like this vision is centered that way. Preliminary renderings should never be taken literally, only as a guideline. This project probably won't look anything like it's current configuration (though they'll most likely keep the traffic circle). Our best indication is when they release the rendering of the highrise that was proposed for the Holiday Inn site last night. Then we'll have a better feel for how this will play out. This is exciting for P-Town. There are some nice things going on over there - Va. Sports Hall of Fame is great by the way! - Image the combined Norfolk-Portsmouth skyline in the future - WOW! Anyway, there's a long way to go - here is the downtown skyline now from the park next to the PETA Building about a week ago. 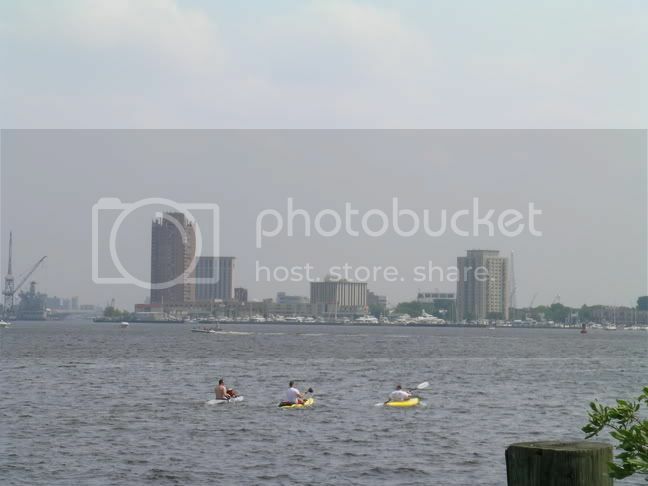 Can't wait to kayak through the new downtown skyline! Good point. The Va Beach TC is developing much different from the initial planned rendering, and so will Portsmouth's. I have a lot of hope that Portsmouth will develop mini Miami-like condo towers! I realize this thread is about P Town but speaking of development in Chesapeake - Seems like I read or heard once they wanted some type of town center. Wonder if it is true and where would it be constructed if so? It has been 4 years since I've lived in Chesapeake, but I don't recall any Town Center type of development. I only remember hearing about malls and shopping centers. But, I do hope they develop some mid-rises or so near the Holiday Inn and the twin brown buildings near Greenbrier Mall. We'll call it TC-lite . Yeah that is true. Compared to the original rendering of Va. Beach's TC, at this rate Va. Beach's TC will have a few less high-rises than planned. It's because of that, that currently I haven't taken this proposal seriously. I love the design and look of the rendering but I won't be surprised if some view it as far-fetched. 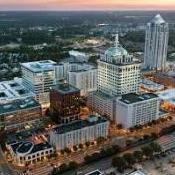 Va. Beach's TC and Norfolk's Downtown make immediate favorable environments for a "6 high-rises" proposal than P-town. Nothing personal to P-town 'cause I travel through the Downtown tunnel and Berkley Bridge alot and love how Norfolk and P-town gives that huge metro feeling traveling that way, I just see too much work and need of changes before anything like that comes around. Additionally, it's a consultants proposal and no real projects 'cept for the Holiday Inn site. At least the Va. Beach rendering was created by its developers, Divaris and Armada Hoffler. I think P-town will really see 4 new high-rises than 6 but we'll see over the next 5-10 years. I think P-town will really see 4 new high-rises than 6 but we'll see over the next 5-10 years. 4 is a good number. That being said i think the project may have a better chance of seeing all it's particulars come true than TC ever did. You have to remember that the reason that TC was scaled so far back initially (I say initially because the components that were scaled back were simply moved to phase 4, which is currently in the planning stages) was due to 9/11. Office, hotel, and residential demand dropped sharply in the aftermath and the climate simply wasn't right for a lot of highrise residential and office towers. Contrast that with the environment that this project is entering into, high residential demand and the resurgence of business in Norfolk, and i'd say our chances are better than 50/50 that this vision will be seen through. Lets not forget that these towers will be mostly for Norfolk business. The market is for people to live there and hop on the ferry in the morning directly to work. No traffic. No tunnels. A little bit of daily exercise. These projects will definately be going through, short of a catastrophe. It won't be over night, but as business continues its growth dt so will portsmouths towers. Also the towers shown on the plan would be built on property next to the pavilion, not over top of the downtown tunnel. There is plenty of land for waterside towers there. This is the same consultant who did downtown hampton's vision, at that vision is already under way. Some mixed use condo's are already started and under construction, every thing looks about the same as propesed. True things will look different because rendering are just that, artistic drawings. Nothing ever looks as good in person than it does in drawings. Also, in architecture, you will find that architects don't know how to stop designing. A building that starts out will look completely different by the time it starts construction. Walking to work from home in HR is only a dream for many of us. It would be great to do so. No driving means no traffic and much less stress in life. Not to mention being in the outdoors and being a part of nature for a few moments. With the addition of these buildings and Norfolk and Portsmouth combining would be awesome! I don't know if that will ever happen, but these developments have to be some kind of boost for the city with these possible increase of tax revenue for the city that might get the dieing city a chance to get away from the red. I have this argument with a friend of mine all the time. I agree with you. suburban residence. He values all that green space and convinient surface parking that most proponents of density and walkable areas are out to rid us of. Odd as it might seem to anyone here, suburbia is still a dream for many. Probably for many more than nice urban dwelling is. Let's hope this proposal doesn't get shot down and we do have these high rises going up in Portsmouth. I hate when things are proposed and then shot down. Raises everyone's hopes up and then drops them.